I know implicit_plot3d has an opacity option to set the opacity of the plotted surface, but how can I set the transparency of the background? You have to use the opacity keyword, unfortunately. See the docs (search for 'transparent'). @kcrisman. I reworded the question to better reflect the intention of the original poster. The question is really about the (white) background, not about the plotted surface. Can the opacity keyword deal with that? opacity makes the whole thing transparent. The desired result is as @slelievre points out, to just get rid of the white background. Sorry I can not find anything helpful when I search "transparent" on the docs. Again, thanks for your help. Best way to import Sage 3D functions to cubes in Unity3D? 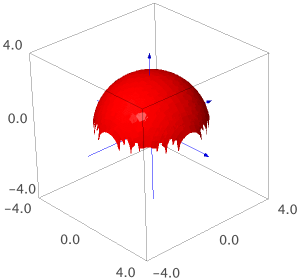 How to plot implicit3d plot with level sets in SageMath? No fillalpha after eps export?